Walking back through the woods after spying on observing the eagles, look what I came across. 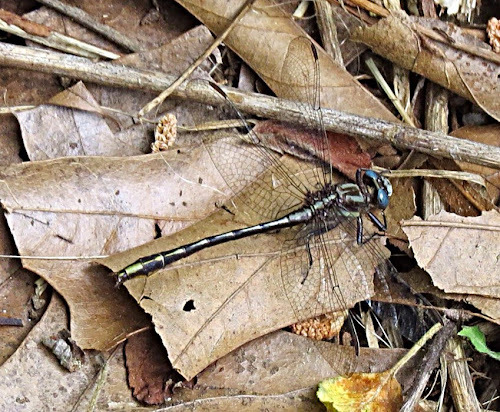 Ever since I learned about Dragonflies and Damselflies on a field trip last year at Goodwin State Forest, I look at them with new eyes. Did you know that Dragonflies bite? Yep...I saw it with my own eyes. My kids love catching dragonflies! It was from them that I too learned dragonflies bite! According to them, dragonflies also chew carpeting if you let them. Beautiful shot! I like dragonflies. Love the photo! I've been seeing a lot of dragonflies this year, and never thought about them biting, at least it's not a snake! :-)! Nice shot - with the jaws they have I am not surprised that they can bite! They are beautiful but scary the way the fly around. lol Now I know to be scared of them biting too! lol Last month a stink bug bit my daughter on the cheek! She said it hurt really bad and that odor they put out was awful. She even said that she had a bad taste in her mouth from it. It was awful! I also had to clean out my pot and pan drawers in my kitchen because they smelled like those nasty things and my pots were smelling like them! I didn't find any in there but I washed everything. Dragonflies are beautiful. We used to have lots around Perth years ago but in the 1940s they sprayed to get rid of colonies of Argentine ants and I've hardly seen a dragonfly since. Many insect species disappeared at the same time which seemed such a pity but those ants had to go as they were invading everyone's houses. I don't think we have damselflies here in Oz but my husband speaks of them in England (where he was born). I certainly didn't know dragonflies bite but, come to think of it, I think they worry horses so they probably do give them a nip or two. I love dragonflies. We sometimes get one flitting around in the garden because a couple of people nearby have ponds. I love to see them. Well done for getting that close. Great capture. They don't light too long sometimes and yes, they do bite! I have a friend that is terrified of them as she was bitten once.